One mom thing I am not great at is loose unstructured playtime. While I thoroughly believe in the power of boredom for kids, when three-year-olds get bored, they get in trouble, and I get annoyed. Besides, my husband is a natural at the unstructured playtime, so I let him do the standing around by the play structure and the barrelling down the hill on the wagon. I’m way too lazy for that. I prefer activities, especially arts and crafts. So when I get a bonus morning with my daughters and haven’t come up with an activity in advance, I scramble to throw one together. 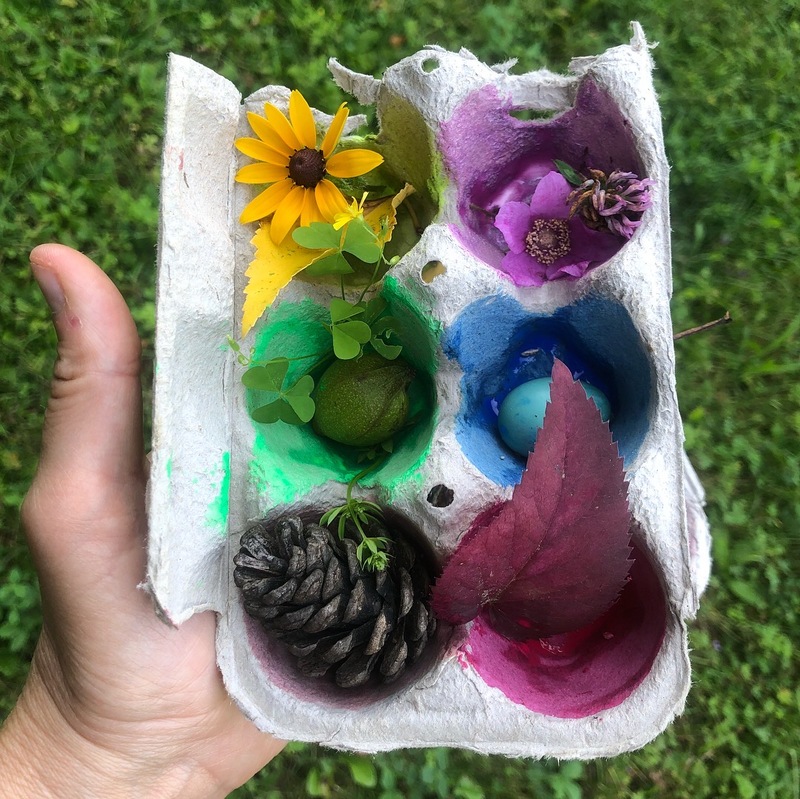 So it was that yesterday, I quickly painted the cups of a half egg carton in six different colors, and the girls and I set off on a color-treasure hunt. The idea was to find items in nature in each color. We set out on a walk up the dirt road, our eyes glued to the ground as we tried to find objects in the right hues. Green and brown were pretty easy. Eventually, we found wildflowers in pink, yellow, and red. But blue vexed us. Blue is the most popular color in the world, according to a Dulux Paints survey and my personal sampling of humans over time, possibly subjective. Blue is also the rarest color in nature. It’s easiest to find in sky and water, but small objects — animals, flowers, plants — are far less often blue. 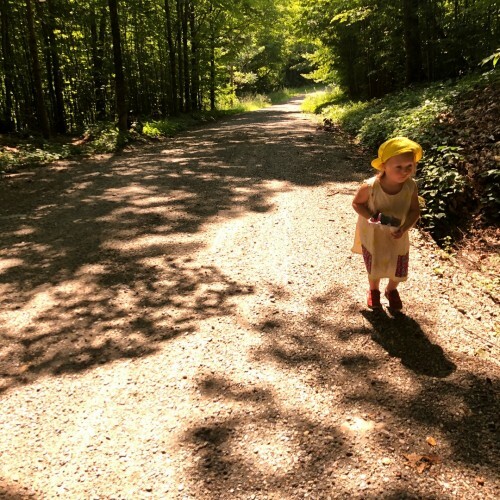 Phoebe was getting tired of walking, and I was beginning to curse myself for painting one of the cups blue when it could so easily have been white or orange — very easy colors to find in nature. When all of a sudden! 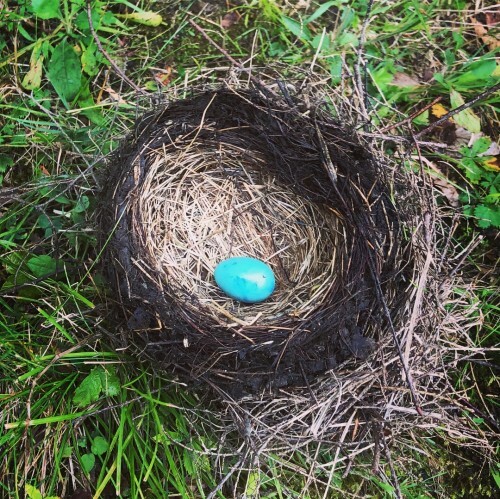 Eliza found the holy grail of blue natural objects: a perfect robin’s egg. Sadly, the egg was lying next to a nest that had fallen out of a tall tree in our yard, and the shattered eggs around it indicated a tragedy of epic proportions. The egg was cold and no longer viable. Sad, but also great fortune for us. Triumphant, we returned to the house to show the girls’ visiting Gramma their spoils. It was also time for Phoebe to ask me a bunch of questions about “what happened to the birdie.” I am not great with the death discush, but I tried to explain in a neutral tone how when the nest fell out of the tree, the birdie inside became cold and died. She looked at me with a basic expression that was hard to read. Then she cracked the egg open on the counter to look inside. 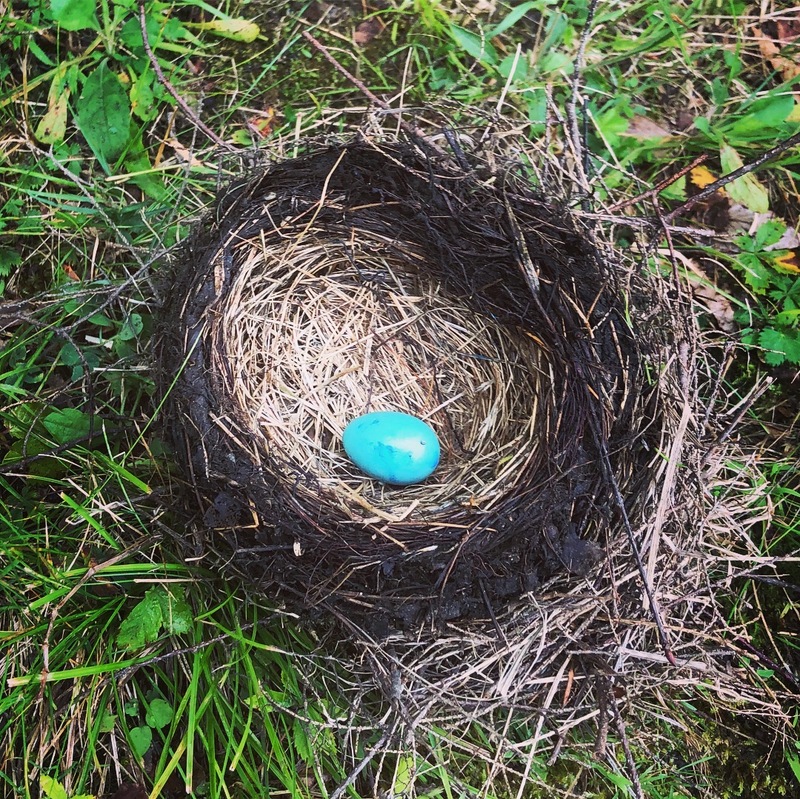 So much for our beautiful blue robin’s egg. I swooped the bird embryo and shattered shell off the counter and we moved on.